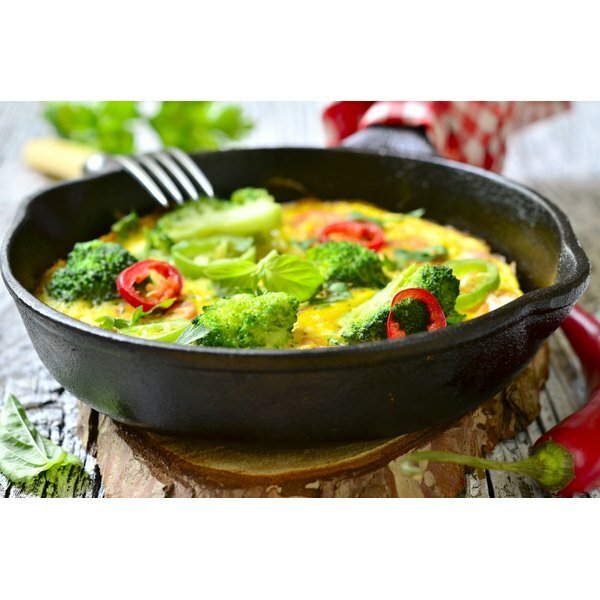 An omelette in a skillet. 3 How Do I Get My Flour to Stick to Meat When Frying? Lacto-ovo vegetarians are vegetarians who include dairy products and eggs in their diets. The "lacto" refers to milk products, derived from the word lactation. "Ovo" refers to egg or ovum. Lacto-vegetarians don't eat red meat, white meat or fish. Despite these dietary restrictions, lacto-ovo vegetarians still have many food options including popular items such as ice cream and pizza. Following a lacto-ovo vegetarian diet doesn't give you a free pass from cholesterol testing. Many people mistakenly believe that eating vegetarian automatically results in lower cholesterol levels. If you consume eggs and dairy products daily, you may still have high cholesterol levels. You'll still need to limit your intake or eggs and dairy products in order to maintain healthy cholesterol levels. For variety, try yogurt and milk from other animals including sheep, goats and water buffalo. Natural food stores usually carry these products. Lacto-ovo vegetarians can use a variety of meat substitutes when preparing their favorite recipes. Seitan, also known as wheat-meat, is made from wheat gluten. It's high in protein and has a meaty texture, making it a good substitute for beef or chicken. Beans serve as a good meat substitute in chili and soup recipes. Baked tofu is a good substitute for chicken. Tofu gets a bad rap, but it's a versatile food and is quite tasty when prepared properly. If you want to limit your egg consumption, tofu makes a good egg substitute. Lacto-ovo vegetarians who are motivated by ethical reasons usually don't eat cheese made from rennet, an animal's intestinal lining. They also avoid eating vegetarian foods that are cooked or fried in oil used to prepare meat and animal products or food that is prepared in pans or cookware used to prepare meat. Individuals who give up meat for health reasons typically aren't concerned with these aspects. Some lacto-ovo vegetarians only consume free-range eggs or "cage-free" eggs and organic milk. Many new vegetarians can benefit from not letting others know about their new dietary choices. It can be difficult, and sometimes awkward, to explain your new eating habits to others, particularly if you've been spotted at the local steakhouse just weeks earlier. Wait several months before letting friends and family know your dietary restrictions so you don't jeopardize your success.